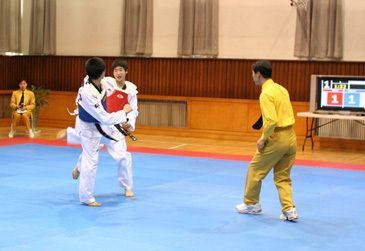 The World Taekwondo Federation (WTF) held a demonstration of electronic protectors in Seoul on March 25, 2006. The demonstration, the second of its kind by WTF after the July 20, 2005, demonstration, drew four electronic protector manufacturers — LaJUST of Korea; ATM of Austria; True Score (Impact Measurement), a joint venture between the United States and Korea; and Daedo International of Spain. The one-day demonstration, which took place at Kyung Hee University in Seoul, took place before WTF President Chungwon Choue and other WTF leaders from home and abroad, along with members of the ad-hoc WTF Electronic Protector Committee. Also in attendance at the demonstration was Dr. Cha-Sok Park, president of the Pan American Taekwondo Union. In the morning, all the four participating companies demonstrated their respective body protectors, while LaJUST and Daedo showed off their body protectors and headgear demonstrations. In the afternoon, there were also question-and-answer sessions. "The demonstration today is very important for the future of taekwondo and the WTF. We will do our utmost to make judgement and refereeing at taekwondo competitions the most objective and transparent," said Dr. Chungwon Choue, president of the WTF. As part of the WTF's ongoing reform program, the ad-hoc committee on electronic protectors was set up in July 2005 and held its first meeting, together with a demonstration of electronic protectors, on July 20, 2005 in Seoul. Among other committee members are Mr. Amr Khairy of Egypt, vice chairman of the WTF Technical Committee; and Mr. Chakir Chelbat of Sweden, member of the WTF Refereeing Committee. In accordance with the recommendations of the ad-hoc committee after the first demonstration on July 20, 2005, the WTF commissioned the Korea Institute of Sports Science to produce a report on basic specifications for electronic protectors. On Dec. 30, 2005, the WTF announced the KISS-set specifications. The ad-hoc committee on electronic protectors held meetings on March 24, 2006 and is scheduled to hold another meeting on March 26 at the WTF Headquarters. At the meetings, the committee, aimed at developing criteria for evaluating the technological aspects of electronic protectors, is to finalize the time table for the certification and recognition procedures of electronic protector companies. The WTF aims to introduce the new electronic protector system at the 2007 World Taekwondo Championships to be held in Beijing, China, and plans to use the new system at the 2008 Beijing Olympic Games to ensure fairness of refereeing and judgement at taekwondo competitions. The WTF Reform Report, which was produced in February 2005, recommended the introduction of a highly effective and accurate electronic protector to be a valuable addition to the sport by helping make judging more objective.